In 1959, the number of Television sets (all Philips) may have been 180 and by 1969 the number had grown to 1250. In 1969, the first Indian television factory opened at Kanpur producing those 1250 sets. In 1970, it grew to 22,00. But by 1977 the number had grown to a Quarter Million, and the number of Tv manufacturers had grown to 40. 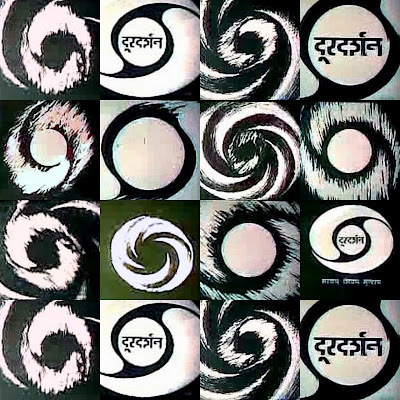 In 1965, Doordarshan started broadcasting News. A couple of years later they came up with an English current affair bulletin named 'Prespective'. Then in 1971, came English News. In 1975, Vikram Sarabhai came up with his Indian National Satellite (INSAT) plan to send TV signal all over India. Initially an American satellite was used for the purpose. On April 1, 1976 Indira Gandhi went on television to announce the separation on Doordarshan from Air. Doordarshan got its signature - NID (National Institute of Design) designed montage with music by great Ravi Shanker. In 1984 was born DD 2. Then came the golden era of Doordarshan - the 80s that started with Asian Games, color broadcast and mega (152 episode) tele-serial Humlog based on work of Hindi writer Manohar Joshi (and they forgot to mention, inspired by Mexico's 1969 popular tele-serial 'Simplemente Maria'). Things were on a roll for Doordarshan. Tv ads were born and so were videos on National integrity. People were hooked. But maybe not all were hooked to Doordarshan. They were hooked to television. 'Doordarshan was all we had' - is the refrain. In 1991-92, 25 lakh people got cable television. Today there are over 70 million homes in India that have cable. Today 115 million homes have television. Today we have 388 television channels and 400 million television viewers in India. Out of 115 million home that have television ( subtracting app. 70 million homes that have cable), 45 million still only have access to one and only Doordarshan. Lots of numbers. Talk about power of charity and giving. That's how it all started - The humble beginning of Doordarshan and Indian television. And humility is now the one thing missing on Indian television. Found this video of “The Golden Trail , DD@50 :Special feature on Golden Jubilee of Doordarshan”on Youtube. It's a half an hour feature uploaded in three parts (actually there are two more but only three concern the documentary). Enjoy! Salma Sultan, the most famous Doordarshan News reade. Information and Broadcasting Minister Ambika Soni did promise that we are going to see Commonwealth Games of 2010 in HDTV format. Ah, yes! I do remember it. I first heard about this TV License Raj in Pakistan of 90s and then realized we too had this thing. And then there were Kashmiri folk dances! Grammar alert: And it was a darn sight better then the trash that passes off for entertainment *today*! I keep hearing about awesomeness of Doordarshan Srinagar. Just the other day an elder cousin told me about an old Kashmiri tele-serial called 'Tahkhana' - it was a Horror show with elements from Dracula lore. I was fascinated to know that our local channel could come up and then show a serial like that. For a small outfit, it seemed to be staffed by some talented people. The programmes were entertaining without catering to the lowest common denominator. There were a couple of good serials, and someone with excellent taste in cinema was picking out the Sunday movies and songs for "chitrahaar". The skyline over Barzulla (where I lived) was dotted by towering antennae to catch "Dhoop Kinaare" & "Hisaar" & "Diff'rent Strokes" from PTV, Lahore! Border people always remember "Dhoop Kinaare" (1988):) But I don't remember it, I was too young and we didn't get PTV at Chattabal. I started watching PTV in Jammu. Mostly for their English movies, cartoons, some serials and Neelam Ghar (Jawab Durust Hai! Gai Soap ki taraf say Juicer-Mixer-Grinder aap ka hua). Sometimes I also used to watch their News. Their News was a wonder in itself. While Doordashan had almost nothing to offer, PTV offered figures that had entire Indian Battalions and whole Kashmiri towns disappearing. PTV kept up with good content for some time even as Doordarshan went into decline. neelamghar was a hit in Kashmir.."jawab durst hai jee ..."
and i do remember that our own srinagar Doordarshan used to telecast a horror serial in kashmiri, i was a child then and used to get really scared ..
the comedy serial that you must be talking about was "Hazar Dastan" that had Ahed Raza Nazir Josh. I have a post about it at my Kashmir blog. forget tv licenses - there used to be radio licenses too! O yeah! I have heard about that. Hi Anonymous... I am a student from JNU and doing a PhD on Black and White Televsion in India. Was wondering if you are closely associated with Doordarshan.. Thanks for the tipoff, I will try to catch it. I did catch the show and what a treat it was. I managed to capture some of the show. Will try to share soon. Great write up... it made me nostalgic.